From Maura: "STOP and SMELL THE FLOWERS" is a phrase my Italian Great Grandmother used to say over and over to me. My Grandmother and Mother said it as well and now, I find myself repeating the phrase in myriad contexts to my own children. When we are given a bouquet of flowers, it is our instinct to bring them to our nose. However, many no longer carry the scent that we recollect from the gardens of our childhood. This is because according to the U.S. Department of Agriculture, 80% of the cut flowers used in florists' bouquets are imported. Furthermore, before they are shipped, they are doused with chemicals. Casablanca Floral sources most of our blooms locally. When not from Casablanca's soil, we rely on our farmer friends' talents and hard work to bring you the freshest of the fresh. The recent growth of the U.S. flower farming movement can greatly be attributed to Erin Benzakein, owner of Floret Flower, located in the Skagit Valley of Washington state. Erin is committed to growing, using and promoting local and seasonal flowers in our Northwest communities. Maura Whalen has followed Erin's work for years and recently studied with Erin, with a focus on garden peonies and roses! Debra Prinzing is renowned as "The Mother of the Slow Flowers Movement". Debra is the author of the 50 Mile Bouquet, Slow Flowers and numerous gardening books and publications as well as the founder and facilitator of the Slow Flowers podcast which airs weekly. 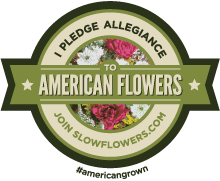 Debra is a passionate advocate and supporter of U.S. flower farming and all of the businesses that rely on those farmers. Maura has been interviewed twice on Debra's podcast as well as highlighted in several of Debra's articles including one for Alaska Air's magazine and the Florists' Review. The SWGM is a farmer-owned cooperative established in 2011. The market is committed to providing the very best the Pacific Northwest has to offer in cut flowers, greens and special botanicals from flower farms across Washington, Oregon and Alaska. SWGM is Casablanca's number one place to shop when not harvesting outside of Casablanca's studio. The community of farmers and florists found every morning there makes shopping a slow but oh so enjoyable experience. Maura is a member of Slow Weddings Network: a global organization committed to connecting intentional, passionate vendors with one another as well as with engaged couples who wish to create personal, unique and memorable celebrations. In November 2015, Maura Whalen gathered a group of six independent floral designers from the Greater Seattle area to form a professional organization whose guiding principle is collaboration. The belief: just as there are numerous wedding photographers, there can be numerous florists in any given area and we can all help one another succeed. 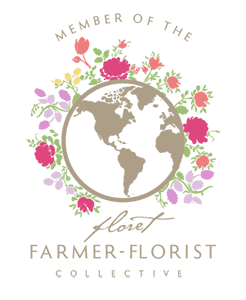 Today, Flower Power meets monthly and has more than 40 members including flower farmers. Flower Power was featured in the Slow Flowers' Podcast. Listen Here.